Everyone is back at school and at work. As I settle into my routine, I am in constant search of easy, quick, satisfying and of course healthy recipe ideas for dinner. Here’s a good one that requires little ingredients and can be easily modified according to what’s in the fridge. I’ve already written about the health properties of buckwheat but a small recap; this is a gluten-free option, rich in iron and a very good source of rutin, an antioxidant known for its cardiovascular and circulatory properties. 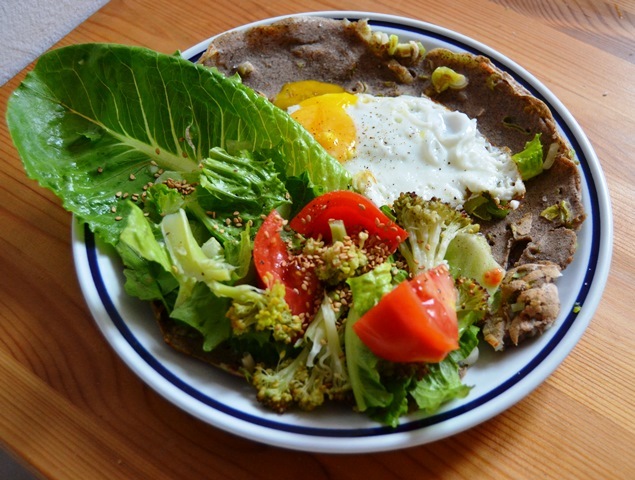 Look for buckwheat flour at your health food store. You can find miso paste there too! I’ve added miso to the recipe not only because it gives a nice salty flavour but also because it is a great source of probiotic, something all of us need at the start of automne to keep our immune system strong. I’ve given my crêpe an Asian flair with the sesame seeds and an Asian salad dressing. Try varying the recipe by leaving the leak and miso paste out and topping it with smoked salmon, capers and red onion; Mexican style ingredients or fruit and yogurt for breakfast. In a large bowl dissolve miso paste with 1 cup of hot water, add remaining water. Mix in egg, flour and leak with a fork. Grease frying pan with oil. With a ladle pour crepe mix onto hot frying pan. Flip crêpe once it changes color and leave cook for 30-60 seconds.